The 8' x 20' High Peak Solid Sidewall offers shade from the sun as well as privacy from the surroundings. This Solid sidewall is whether and water resistant. Our solid style sidewall is fire retardant according to safety standards. These side walls easily attach with clip fasteners and velcro together allowing walls to be completely enclosed when needed. These side walls are designed for High Peak Frame Tents Only and will not fit standard pole tents or west coast frame tents. 20" x 16" x 12"
Sidewalls will also fit Tent and Table tents manufactured 2010 and later via the clip connection (your top MUST HAVE rope to connect the sidewall). 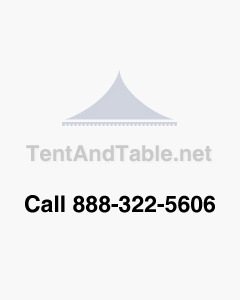 Safety: Tent and Table, LLC uses a fire resistant vinyl that meets or exceeds the National Fire Protection Association fire resistant standards.